AppVeyor is a well known cloud build server, which integrates with many source controls like VSO (Visual Studio Online), GitHub, BitBucket etc. Like many others do, we love Appveyor. However, most of the time we spend our time in Visual Studio and interacting with Appveyor was not possible from within Visual Studio. So we decided to build an extension! So what is in the first version? Go to individual project specific pages from extension. Once you install the extension you will see a new menu item “AppVeyor” in Visual Studio’s View menu. 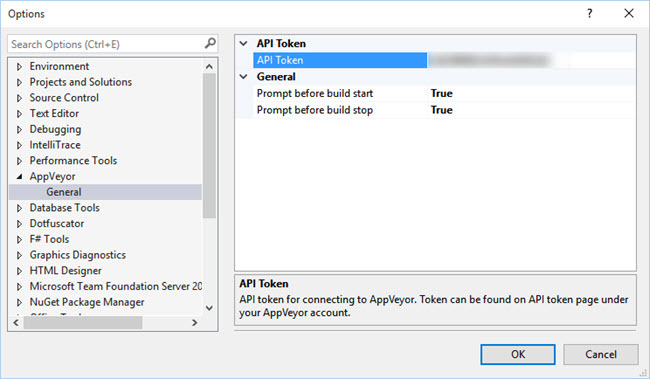 Before you see your configured projects you need to enter your AppVeyor API token in Options. This is required for extension to communicate with your AppVeyor account. We use bearer token authentication to access AppVeyor API. You can do that, by clicking gears icon on the toolbar. Clicking that will open options window. Once you have entered correct API token for your account, extension will automatically fetch the projects and display it in the tool window. The tool window now will look like below. As you can see in the screenshot above, the toolwindow looks similar to web interface of AppVeyor. The additional buttons on the right hand side of the toolwindow will allow you to start and stop the build, and browse additional options which at this moment take you to web interface. Our plan is to get these also within the extension in future releases. This a beta version and our extension does only part of what AppVeyor supports. You may encounter few bugs in the extension, but we promise we did not leave them intentionally, so please report them to us and we will plan to fix. We hope you like it. If you do, please share and rate in the gallery.